This Healthy Egg Muffin Cups Recipe is one of our most popular recipes (originally posted January 22, 2015), so I’ve updated it to include a how-to video! Enjoy! 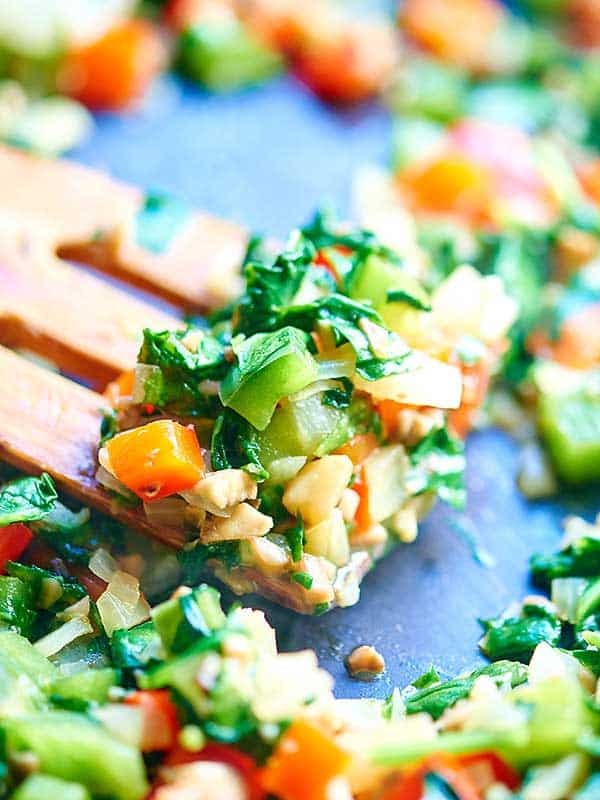 Healthy breakfasts ensure I make healthier choices throughout the day, that’s why I also love these other healthy breakfasts: roasted vegetable breakfast muffins, breakfast burrito bowls, healthy baked oatmeal cups, healthy breakfast casserole bites. Trevor and I have never really made New Year’s resolutions in the past. I’ve tried before, but I feel like I always “forget” a few weeks days hours in. So instead of deciding to change our lives on January 1st, we’ve slowly started working toward our new goals, not just for 2015, but hopefully, forever! One thing that’s really important to Trevor and I is reading. I’ve always been a huge reader, but recently have had a hard time squeezing in the time to do it. The main idea is to become more productive, happier, etc. and that starts with a great morning routine! For our morning routine, Trevor and I have been waking up earlier, reading for thirty minutes, and then having breakfast together. Although we now have more time in the morning, I still don’t want to spend my mornings whipping up an elaborate, healthy breakfast before work. 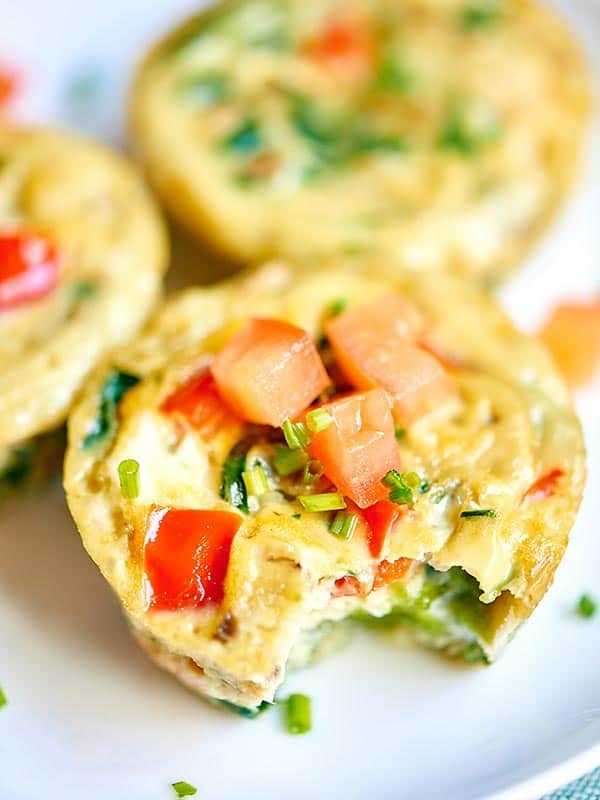 Enter: Healthy Egg Muffin Cups! I talked about how important it was for me to get in tons of veggies first thing in the morning in my post about the amazing No Banana Berry Green Smoothie. That smoothie is a really great way to get in tons of veggies and fruit in the morning and it’s super quick to put together, but sometimes I need something hot to really get me going. 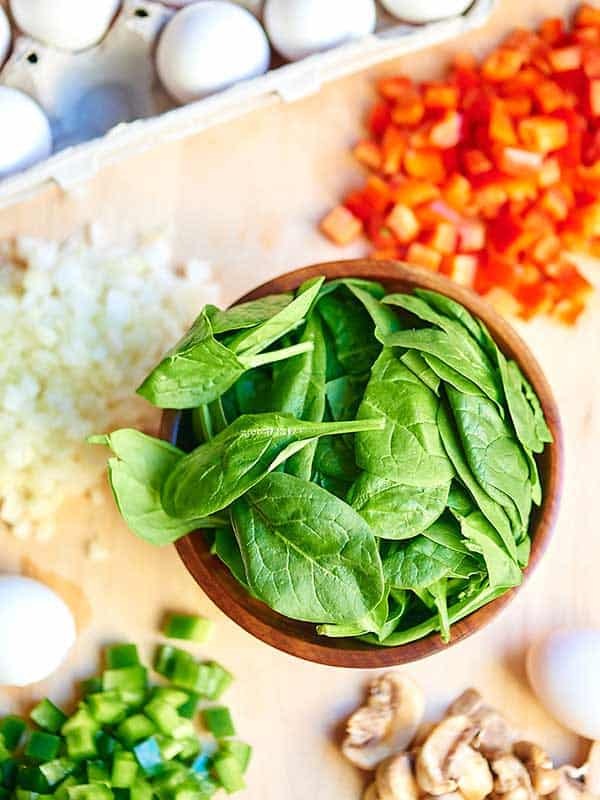 Start by chopping some veggies: red pepper, green pepper, yellow onion, mushrooms, and baby spinach! I like chopping everything pretty small, because I’m not a fan of big chunks, but the size of veggie is up to you! Now mince some garlic and crack the eggs! I used 4 whole eggs and 4 egg whites. and set aside. I like whisking the eggs in the measuring cup, because it makes pouring the mixture into the muffin tin easier later on! Now, heat a non stick pan over medium heat. Once hot, add in olive oil. Then add in the red pepper, green pepper, yellow onion, and a pinch of salt. Saute for about 5-7 minutes, or until the peppers are tender. Add in spinach and mushrooms and cook for another 2 minutes. In the last 30 seconds, add in minced garlic. Taste and re-season with salt if necessary! Pour the cooked veggies into the whisked eggs. Stir to combine. If you like, you could even add in a little hot sauce. Preheat the oven to 350 degrees F and grease a muffin pan with cooking spray. Pour the egg/veggie mixture evenly into the muffin pan. You’ll have enough for all 12 muffin slots! Bake for about 15 minutes, or until the tops are firm to the touch or if an inserted toothpick comes out clean. Let cool in the pan for a few minutes, before removing! Serve immediately or let finish cooling on a cooling rack. After millions of views, here are some of the most frequent questions we get about egg muffin cups. 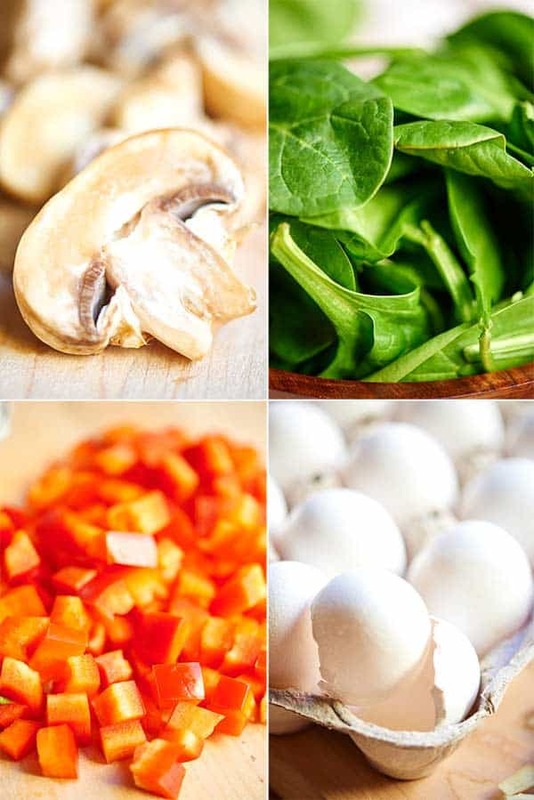 You can keep these in the fridge for about 4-5 days, which is PERFECT for healthy breakfasts throughout the week. You may see extra liquid in the bottom of your storage container because of all the vegetables. Don’t worry, it’s totally normal. If the excess liquid bothers you, just blot the muffin before you warm them up in the microwave. Can you freeze egg breakfast muffins? Yes! These actually freeze really well. Let them cool completely before placing them into sealed airtight containers. They last about 3-4 months in the freezer. Since I’m queen of being lazy in the morning, I love popping these in the microwave for about 30 seconds or until warm. You could also reheat these in the oven. I’d say 350 degrees F for about 5-10 minutes. If you’re cooking from frozen, you may need additional time in the microwave/oven. If you try any of these techniques, you’ll have to let me know in the comments below! What is the point of an egg cup? It’s quick, it’s loaded with protein and vegetables, it’s portable, and it’s already portioned out! 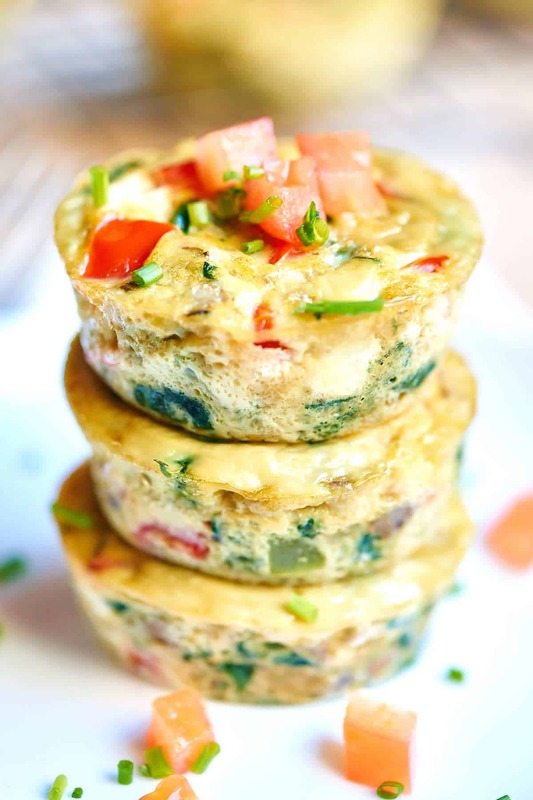 I love that these healthy egg muffin cups can be made in advance, because I know a lot of people just don’t have the time for a healthy breakfast, so they grab something else on the go that may not be the healthiest option! Even if you DO have the time, these are so delicious that you’ll want to make them anyway 😉 These muffin cups have less than 50 calories per muffin, so eat up and serve with some toast, your morning coffee, yogurt, etc! Psssstttt…Right now, newsletter subscribers get my FREE PDF All-Stars Cookbook with this recipe. Hurry and sign up here if you like FREE yummy food! 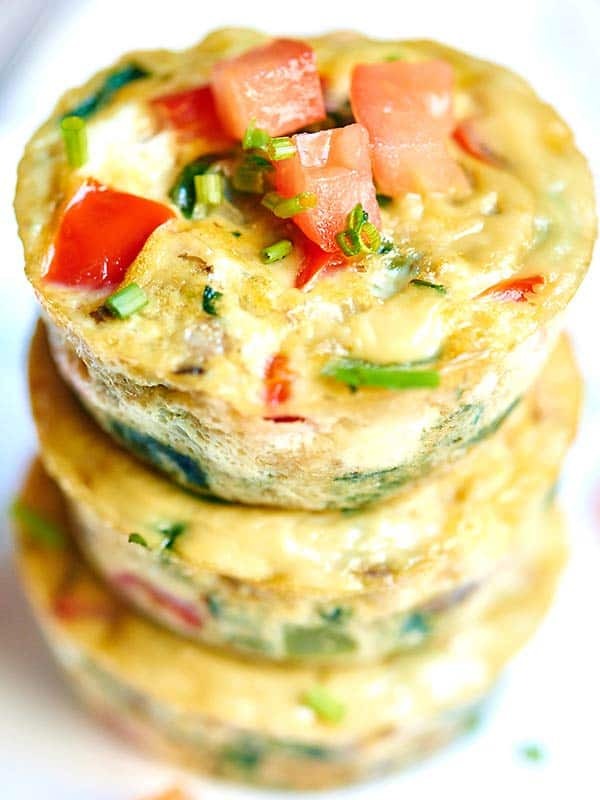 These healthy egg muffin cups are packed full of veggies and protein and are truly tasty! It’s a fun way to eat eggs and can definitely be eaten on the go! If you like these, you might also enjoy these other healthy breakfast recipes. I love that these healthy egg muffin cups can be made in advance. These muffin cups have less than 50 calories per muffin and are packed with vegetables, so eat up and serve with some toast, your morning coffee, yogurt, etc! Calories are for one muffin, so eat up and serve this with a side of toast, your morning coffee, yogurt, etc! I love these! Not only are they cute and healthy, but they’ve got so many good flavors packed into them! I have made these before but by the end of the work week they become soggy. Any ideas on how to prevent this? Otherwise…DELICIOUS! Hopefully plotting the vegetables will work! I do end up with the muffins being wet, very moist. They are very testy and so easy pulling them out of freezer night before. Love how these can be frozen and thawed on-the-go! I made these muffins for brunch one day and they were a huge HIT. Nobody could believe how much they liked them and when I mentioned that they were healthy (I only used egg whites), they were shocked! I was going to ask if all egg whites would work. I cannot currently eat the yolks. Did you use 8 egg whites? THANKS! These are in the oven RIGHT NOW! I have been eating hard boiled eggs every single morning for over two years now and I just wanted to change it up a bit. I’m really looking forward to these! Thanks Stephanie! I hope you enjoy them as much as we do! 🙂 It’s such a great, healthy recipe to start the day! Hi! I made these and they are delicious- but mine collapsed after taking them out of the oven. Any hints for next time I made them? A little bit of corn starch might help the moisture. Oo. I’ve never tried that! I actually don’t mind the extra moisture. 🙂 But you’ll have to let me know if you ever try it with cornstarch! I was just about to ask this too! Some of my veggies had been in the freezer, but I did drain a lot of water from the pan when I cooked them (maybe not enough). In any case, they are DELICIOUS! I added a little cheese and a bit of chopped tomatoes. I LOVE them and have been telling everyone about this recipe and your blog. Thank you! Love to make these! Another tip would be to make the veggie mixture overnight so in the morning just bring it to room temperature,tip it in the eggy mixture and bake! I’ve made a different version of these eggs several times…but I always have problems with them sticking to the bottom of the pan, even when it has been greased. Is the key to them not sticking, the non-stick spray? Hi Stephanie! I always use a non stick muffin pan AND non-stick spray and have never had a problem. 🙂 I hope that helps! Did you use standard 12 cupcake muffin tins? Or are they mini? Thanks! I just made these and OMG: delicious. Instead of green bell pepper I used small chopped asparagus and added a couple of jalapeños for some heat. I made my veggie sauté the night before and just did the egg part this morning. Talk about flavorful! Thanks for the easy recipe! Hi Terri! I’m so glad you loved them. 🙂 I love the addition of the asparagus and jalapeno…Trevor and I are both huge spice lovers. Thanks for making (and enjoying!) the recipe! I cooked my veggies earliest and left wrapped in paper towel. Still had a great taste. Thank you for sharing! I’d love to get some more calcium and protein for my mornings; personally think this will taste, and look fabulous with an acai bowl, yes? Acai bowl, egg muffins, morning coffee, fresh juice, and sliced fresh fruits are just necessary and an essential to my summer mornings! Thank you for sharing once again! These muffins will be the death of me! For fall, I think adding a bit of cumin, cinnamon, ginger, anything spice, will be AMAZING. Add some pumpkin puree in your egg mixture, and ohmygod you have the perfect fall egg muffin! Honestly I just strain salsa and use frozen chopped spinach (thawed/strained) cuts down on prep time and I can easily make a large batch!! How long do you reheat these for? I’m always nervous about reheating food, thanks! Hi Heather! I love the idea of adding asparagus. 🙂 I’m so glad that both you and your husband loved them! Great demo and recipe! I have made a version with turkey sausage in the past. You are right! Make them on Sunday and you have a breakfast for the rest of the week. These sound delicious and simple to make. Could they be made using egg beaters as well? If so, what amount should be used? I make these all the time with egg beaters…they come out just fine!!! I love his recipe, I just made them and added turkey sausage. Yum!!! Hi Jannett! Not sure why the other recipe is 259 calories, I’d have to see it, but MY recipe is 48-50 calories per muffin (one out of 12). 🙂 Adding turkey sausage, however, would increase the calorie count. I hope that helps! Sounds so good and easy to make! I am retired now, so this recipe is just perfect. No more morning visit to the local eatery for breakfast. However because I am also a novice cook I have a question. I absolutely hate waste. What can I do with the leftover 4 yolks? May I suggest you include recipes for leftover ingredients. Hi Lucille! Thank you 🙂 You can use the leftover yolks in my Roasted Asparagus & Tomato w/ Lemon Garlic Hollandaise! I love that suggestion…Trevor and I will definitely look into it! 🙂 Thanks again, Lucille! I hope you enjoy the recipes. We still have only one, lonely egg yolk to deal with. Perhaps you could also show how to store or freeze egg yolks. In this instance perhaps with the use of ice cube trays for individual yolks. I have searched the web to find out how to freeze yolks. It requires that we use either salt or sugar (?) Then I wondered how the ingredients added for freezing impacted on the recipe using those thawed yolks. In the end, as a novice cook I would not use your recipe because it does not use whole ingredients. – unless using the complete egg quantity would not affect the outcome. What do you think? Using mini-loaf pans comes to mind if the muffin tins are too small. Hi Lucille! I’d definitely have to do some research on freezing eggs. For this recipe, you basically need 1.5 cups of eggs. I use a combination of egg whites and whole eggs, but feel free to use all whole eggs! I’m guessing you’ll need about 6 whole eggs…just crack the eggs into a measuring cup until it reaches 1.5 cups. You should still use a muffin tin. I hope that helps, Lucille! 🙂 Let me know if you have any further questions. The egg muffins look delicious. I can’t wait to try them. The instruction video is great, as well as the pictures. This is my first time visiting this site. Thanks Victoria! 🙂 Thanks for stopping by…we’re happy you’re here! Hope you love it! Did Cindy mean stick to the paper rather than the muffin tin? That’s a great question…I’m not sure! I’m sure it would be fine either way, but just in case, I’d grease the muffin liner, too! I just made these for the first time and they are so delicious! I made a few changes because I can’t have too much fructose. I omitted the garlic and used garlic infused olive oil instead of the plain olive oil and then I added the green part of spring onions (scallions) instead of the onion. I will probably also try adding zucchini and maybe even broccoli and asparagus for some variation! Thanks for sharing. I plan to make these in batches on the weekend for a quick and healthy breakfast (3 muffins) or a snack (1-2 muffins) Yum!!!! Thank you for the delicious recipe! I am allergic to peppers, so I substituted and made mine with spinach, mushrooms, onions and broccoli! Delicious!! These look delicious! In the video I noticed you cut the ends off the peppers. I hope you didn’t thow these parts away. Hi Bita! Thank you SO much for your sweet comment. 🙂 Congrats to you on your new healthy food blog! 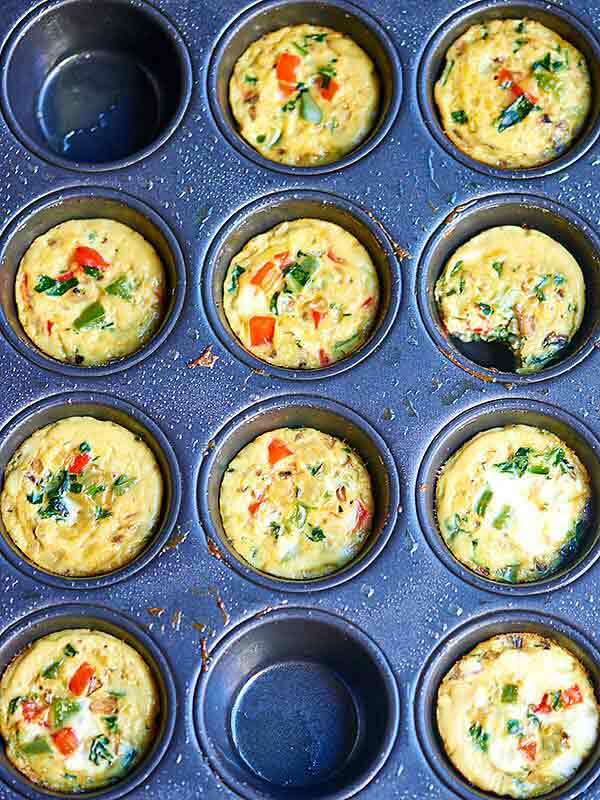 We’re big fans of the healthy egg muffin cups…love how many veggies/protein you get in first thing in the morning. I’m really happy to hear you’re enjoying the videos, we have fun! 🙂 Happy Friday! Wahoo! Thank you so much! 🙂 You’re welcome! We add diced beets as well, yum! So delicious! I added crispy bacon to mine. Can’t wait to enjoy them all week! I’ve been looking to add more eggs to my breakfast meals, but I just don’t have time in the morning to cook. I have a 48 cup mini muffin pan I look forward to using this recipe in. I will just need to finely dice my veggies for it. I know I may need to adjust the cook time but it will be nice quick on the go breakfasts during the week. I needed some variety from boiled eggs, oatmeal, peanut butter toast so I Youtubed healthy breakfast two days ago and this popped up. Made them this morning and they are SO delicious. Lots of flavor, pretty coloring, not a lot of prep or cook time, easy to pack, freezable and reheatable – thank you!!! Also very yummy in a bowl of broth with whatever else you like to put in. If just for me, I use a 2 cup measuring cup. I fill it w/1 cup of broth (usually, organic low sodium chicken), 1 of egg muffins, some chopped Tuscan Kale, diced baby carrot(s), seasonings (your choice), a couple of strips of cooked chicken (or, beef, tofu, etc. ), heat either in pan or micro. I serve in a bowl topped w/green onions, diced tomatoes, a little sprinke of peccorino romano, or? (You can always add more broth to your liking) YUM! I’ve got to try making this for breakfast! It’s sure to be a hit! I will try the recipe tomorrow. I just like to know, I read somewhere not to reheat spinach and mushrooms…..did you hear about that ? Hi Faith! You can just omit the mushrooms or if you want more veggies, you can replace the mushrooms with more red/green bell peppers!